Whether your job is Golf / Muni / Sports Turf / Landscaping / Flatwork / Hardscape / Irrigation, etc., the Next Gen 18" Hydro-Drive Sod Cutter is easy to operate and comfortable to use with variable ground speeds - forward & reverse - and intuitive controls. All new from the ground up, this unit is built upon the most rugged foundation in the industry with a newly designed superstructure frame featuring 50 more pounds of steel and supports a robust new drive and cut system. The machine's new heavy-duty gear box and cutting system include oversized sealed bearings, tight shaft mounted eccentrics and a new one-inch lateral stability bar - all designed to perform in the industry's most rugged conditions providing the next level in durability. The Next Gen Hydro-Drive Sod Cutter now features the popular variable speed fingertip control in both forward and reverse, similar to the innovative Billy Goat hydro-drive overseeder and brush cutter controls - for consistent feel, simple operation and reliability through the hydro-drive family. Compared to multiple settings on other machines, the SC181H features the easiest to use "Set and Forget™ blade depth adjustment to 2.5" with a single lever from the operator station. The unit comes standard with a rear caster wheel for curved cuts and locks for straight cutting and handle isolation mounts absorb vibration for smooth, fatigue-free operation. Other user-friendly features include an hour meter, heavy-duty front bumper bar and six convenient tie-down points, plus text to video for quick access to operating instructions video via your mobile device. SUPERSTRUCTURE FRAME: 50% thicker 3/8" steel substructure and a 1/2" thick steel lateral support reinforces frame rigidity. NEW CUT SYSTEM: Features a rugged cast iron gear box, spiral gears and thick seals. Sealed bearings, one-inch plated lateral stability bar, large aluminum dog bones and tighter eccentric placement for outstanding strength when cutting. Laser clad cutting blade for precision cut and up to 3x blade life. INTUITIVE VARIABLE SPEED FINGERTIP HYDRO-DRIVE CONTROLS: Same as found on the reliable Billy Goat hydro-drive brush cutter and overseeder for a familiar family feel. HEAVY-DUTY TRANSMISSION: Drives 1.25" plated tapered axle with two-inch sealed bearings coupled to a one-inch jack shaft with armor coated chain for rugged drive reliability. SET AND FORGET BLADE DEPTH ADJUSTMENT TO 2.5": Single lever and clamp at user's operating position adjusts simply, saving time and providing precise cutting depths. MULTIPLE OVERSIZED ISOLATION MOUNTS: Absorb vibration so operator completes tasks quickly, comfortably and without fatigue. REAR SWIVEL CASTER: Perfect for curved work and locks for straight cutting. CONVENIENT HOUR METER: Tracks hours of operation to help determine when to service the machine. Also ideal for rental stores to track machine hours of use when rented. EASY ACCESS SERVICE DOORS: Three service doors positioned at front and back of machine offer convenient access for servicing. HEAVY-DUTY BUMPER & TEAR-DROP TIE DOWNS: Machine transport is safe and easy with a heavy-duty front bumper bar and six tie-down points, front and rear positions. WELL VENTED HOUSING: Provides increased venting for cool operation and longer transmission life. UNIQUE DRIVE WHEELS: Two separate wheels designed to shed mud in wet conditions and grip in dry for improved cutting in all conditions. 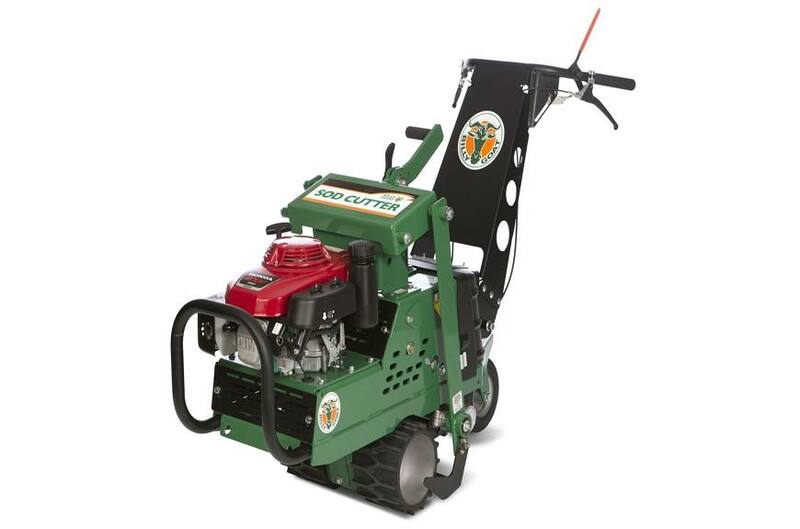 NEXT GEN HYDRO-DRIVE SOD CUTTER WARRANTY: 3-Year Honda engine and 1-year bumper to bumper machine warranty. TEXT TO VIDEO: Label featured on the unit provides access to quick operating instructions video from your mobile device by texting the work "SOD" to 33988!